This is it! The final leg of our Bloody Excursion. Time to put all together and drink! 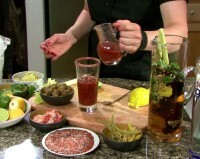 ingredients together, the spicy vodka, the rim salt, the , destination: Flighty’s Bloody Hot Bloody Mary. Its finally time to put the parts together and drink–you’ve waited long enough and I hope you’ve already had a sneaky sip-or two.